This may be one of the strangest combinations I’ve ever posted on this site. But I want you to trust me when I say, it’s actually really, really good. 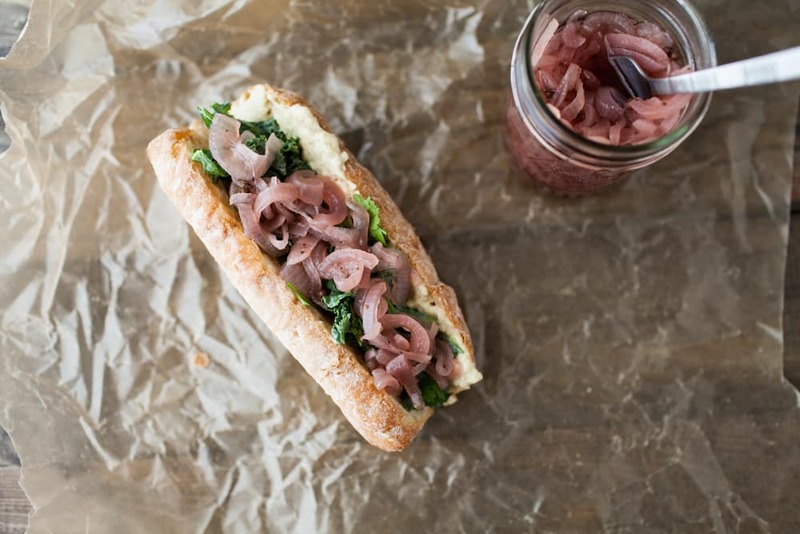 The awesome combination of pickled onions and honey-lime dressing make this sandwich (and frankly, I would have never thought to put all that together). This sandwich is actually inspired by my trip to Indianpolis way back in the early days of summer (more specifically my trip to Duos Indy food truck). Sonja and Alex gave me a great list when I was exploring the city and Duos is where they told me to go for lunch. I had one of the best sandwiches that day. I’ve been thinking about that sandwich all summer. This sandwich is also a big part as to why I have jars (many jars) of onion relish canned in my basement. This sandwich is more of a guidance. If you click over to the Indy post, you can see exactly what they had on their sandwich. I added hummus for a little extra protein to the sandwich but can always be replaced with some smeared avocado (yum)! Slice crusty hoagies in half and smear a 1/4 cup in each hoagie. Whisk together lime juice, honey, cilantro, and salt. Taste and adjust any flavors of which you want more. Shred Kale and toss with dressing. 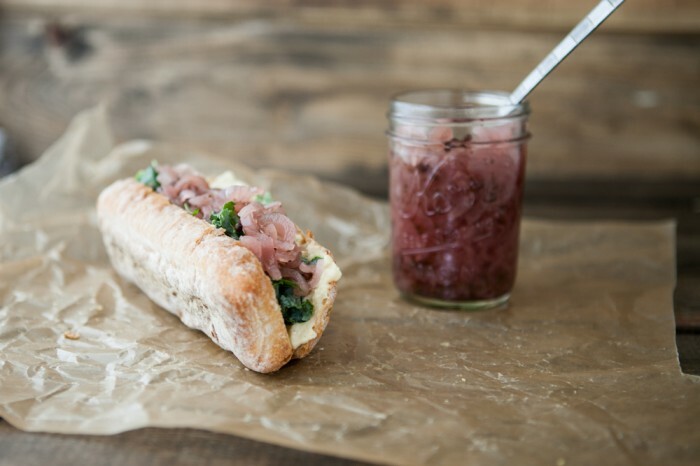 Stuff kale into hoagies. 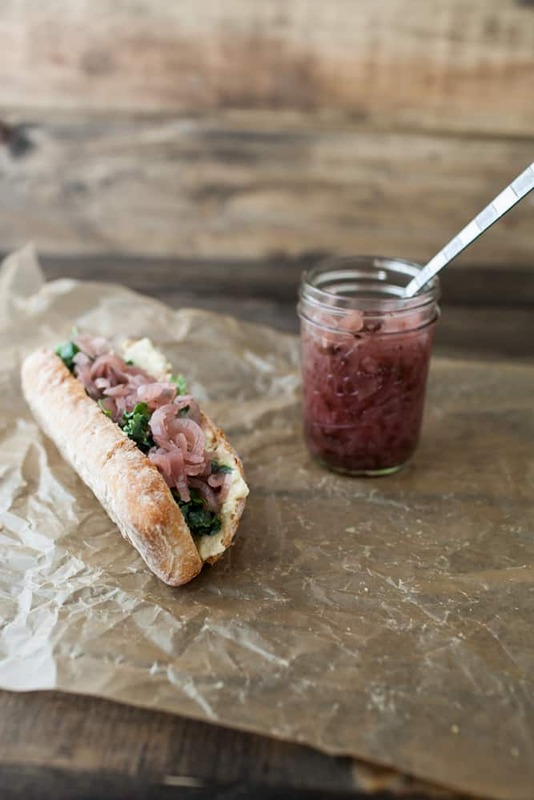 Top with a couple spoonfuls of onion relish. I can see how all these flavours would work together with the combination of sweetness and acidity. Definitely one to try. I wonder what that sandwich would look like on my face. Pickled onions with hummus? Very interesting! I wouldn’t have thought of this, but it makes a lot of sense, what with traditional hummus-falafel-pickled turnip concoctions. 🙂 Must try. Ooh! This sounds really delicious. When I first saw the photo I thought it was going to be some sort of meat, but then I realized it was the onions. I’ll have to show this to one of my closest friends – she’s vegan so I always think to send her recipes! Wow, this sounds like an amazing combination! But then again, the avocado in it sounds good, too – I think I’d have to be a glutton and do both!